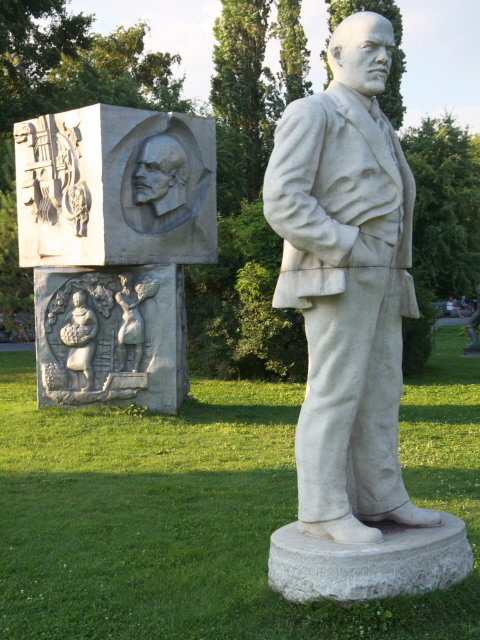 A cluster of statues and sculptures from the old Soviet days, uprooted from their original locations and first “dumped” and then re-erected here in a park in Moscow, Russia. They include plenty of Lenins, some Brezhnevs, Marxes and even a couple of Stalins. More background info: The park these days goes under the official name MUZEON Park of Arts (sometimes also spelled “MUSEON”), but has also been known as Fallen Monument Park or Park of Fallen Heroes or simply Sculpture Park. Never mind the terminological confusion, it all goes back to 1991/92 when during the collapse of the USSR many statues of the old Soviet heroes, now thoroughly unloved, were removed from their pedestals around Moscow and taken here. At least they weren't all just destroyed, as in so many other places across the former Eastern Bloc. At first they were mostly just dumped here but after the Moscow mayor established the Muzeon park in 1992 most of the “fallen” statues and busts were re-erected. Over the next 20 years the collection grew (not all are on display), and from 2011 the whole area underwent a complete refurbishment and redesign alongside the transformation of the Krymskaya Naberezhnaya embankment nearby. Now wooden boardwalks and well-tended paths lead to the sculptures and around the park, which has also been embellished with flower beds and benches. It has since become one of the newer focus points for recreation in Moscow. What there is to see: As a dark tourist you'll want to come here specifically to meet some of the fallen Soviet heroes and see artwork from the not so golden, olden communist days and you can indeed find some remarkable relics of those times here. The largest is a silver double coat of arms with the Soviet hammer-and-sickle emblem in the middle(s) and a peace-proclaiming slogan underneath. Dotted around this are several busts and statues of former leaders. Lenins are particularly numerous, but there are also a couple of Stalins. One red granite statue of Stalin is especially noteworthy in that it has a smashed-in nose, or rather: it has been chiselled off. The symbolism thus is quite altered from the original artist's intention, one has to presume. You can also find Marx, as well as some other old commie figures, of course, and even a couple of Brezhnevs, though the latter are somewhat less prominently placed and rather more hidden underneath trees. 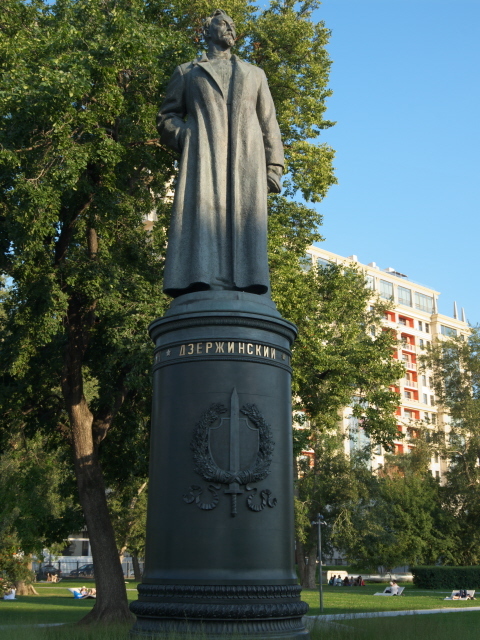 In contrast to that one of the largest statues, and complete with its original pedestal, is an especially prominent one, namely of the ur-Chekist Felix Dzerzhinsky, the infamous founder of the political secret police in post-revolution Russia. Fittingly his statue used to stand outside the Lubyanka building, the HQ of the later Soviet version of that secret service, the KGB. 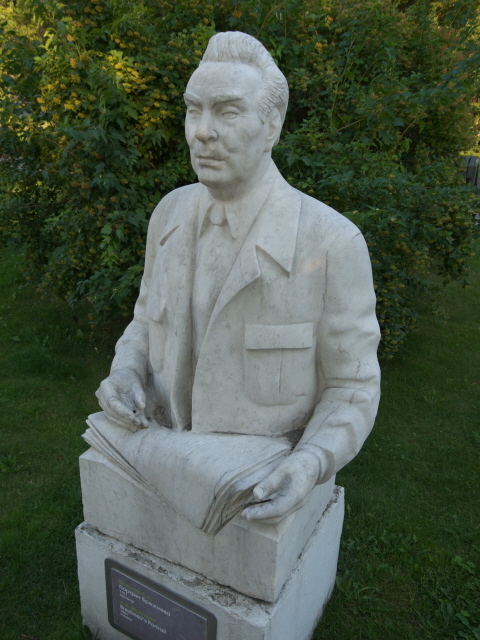 This statue, originally erected in 1958, was moved here in 1991, even before the formal dissolution of the USSR, and before the Muzeon park as such was established (see above). Dzerzhinsky statues are generally much rarer than the usual Lenins and Marxes, so this is quite a remarkable piece (see also the one outside the Tractor Factory in Volgograd and the Museum of the History of the Political Police in St Petersburg). Another exceptional work of art is the monument “Victims to the Totalitarian Regime” that dates back to the 1980s, i.e. before the breakup of the USSR, but presumably not too long before glasnost and perestroika. This work of art is also different in that it is not a depiction of any single named person, but a concrete wall with sections set into it that are filled with granite heads, some featureless but mostly with at least some indication of a face carved into them, but they're all nameless. They are held in their places by metal bars and at the top of it all is a wooden roof with barbed wire and some lamps of a distinctly Gulag-like design (cf. Perm-36). So the poignant symbolism doesn't require much interpretation here, I should guess. But as if to make sure, the old Soviet-era works come with little signs in Russian and English that provide a little background info as to who's depicted, who the artist/sculptor was that made the piece, and when; in some cases there's also info as to the statue's original location and when the move to this park took place. All in all, this is a mostly light-hearted “retro” attraction that you can add on to more serious explorations of Moscow as a dark-tourism destination. Whether it's a must-see site depends. Fans of such artwork will not want to miss it. And I'm glad I've seen it too. But I presume for many others it may not be of such great importance. Location: in the southern part of central Moscow, just north of Gorky Park and south of the Red October complex and the bizarre Peter the Great Statue, behind the New Tretyakov Gallery on Krymskaya Naberezhnaya embankment. Details: To get to the park you have to walk, either westwards from the nearest metro station, which is Polyanka (grey line 9) or from the north, e.g. from the Red October cultural complex opposite the new Cathedral of Christ the Saviour, which is about 10-15 minutes (1 km) away. Or go to Oktyabrskaya metro station (interchange of line 6 (orange) and circle line 5 (brown)), walk up Krymsky Val and enter the park from the south, turning right. Alternatively use metro line 1 (red) to get to Park Kultury station and walk from there crossing the Moskva on Krymsky Most and then turning left. The socialist statues are scattered around an area north and east of the large New Tretyakov Gallery building. Opening times: 8 a.m. to 10 p.m.
Time required: not too long, perhaps half an hour or so. The sculpture park is next to (and actually associated with) the grand New Tretyakov Gallery of modern art, which also has some socialist-realist works from the Soviet period. Unfortunately I've never found the time to check this out, so I can't report any details. (Open from 10 a.m. to 9 p.m. Thursdays to Saturdays, but only to 6 p.m. the rest of the week, closed Mondays; admission 500 RUB). The next nearest sites of dark-tourism interest are actually the very heart of Moscow: Red Square and the Kremlin, which are only about a 30 minutes' walk away to the north. Combinations with non-dark destinations: Other than the New Tretyakov Gallery of modern art (see above) that's directly adjacent to the sculpture park, as well as its older-art main branch (the State Tretyakov Gallery) just to the north-east, there is Moscow's most famous leisure park right next door to the south: the legendary Gorky Park. Like the Krymskaya Naberezhnaya embankment, the park has recently been refurbished and beautified. Just north of Muzeon Park of Arts the controversial (and I would say utterly bizarre) giant sculpture celebrating Peter the Great stands on a little island just south of the Red October cultural centre. From there a pedestrian bridge leads to the giant reconstructed Cathedral of Christ the Saviour. For more see under Moscow in general.